Hostel ROOM Rotterdam i Rotterdam, Nederländerna : Boka nu! On top of the 10% hostelworld deposit, hostel ROOM Rotterdam will always ask a 35% deposit one month before arrival. This deposit needs to be done by international banktransfer (contact hostel ROOM Rotterdam for more information). In case of cancellation within 14 days before arrival, the 35% downpayment is non-refundable. In case of cancellation 7 days before arrival, the customer is obliged to pay 85% of the reservation value to the hostel establishment. We will charge this from the customers creditcard. For groups in the weekend we always require a minimum stay of 2 nights. ROOM, a warm, welcoming place with a personalized touch and a great community feel. Excellently located right in the heart of the city, near all the tourist attractions, stunning architecture and the ferry to Kinderdijk and Port of Rotterdam. ROOM hostel provides you the perfect base for sightseeing by day and partying at night. All of Rotterdam’s major hotspots and nightlife are easily accessible on foot, and in the direct neighbourhood – which is known as the most chic and safest in Rotterdam - you will find restaurants and bars which fits everybody’s budget and preference. Our themed rooms are clean, our beds are comfy and the showers high pressure but what makes us really proud and special is our downstairs living room and bar. Warm, funky and super cozy. It makes you instantly feel at home. Snuggle up on our comfy couches, listen to some great music, play some board games, grab a guitar and meet awesome people from all over the world! Our bar provides you with daily happy hour and a fabulous toastie menu. There are weekly music nights, daily theme nights, free walking tours and guided tours to Rotterdam’s highlights. Don’t miss out on our weekly food nights too. A great way to meet new friends! We are a proud member of the Europe’s Famous Hostels Network, so you will be a guaranteed a fun, safe, friendly and an affordable stay. We have dorms and private rooms (shared and ensuite), a living room, bar, guest kitchen, laundry, 24/7 reception, free parking for busses/ touring cars around the corner, spacious rooms, free WiFi, free breakfast and big lockers to keep your valuables. 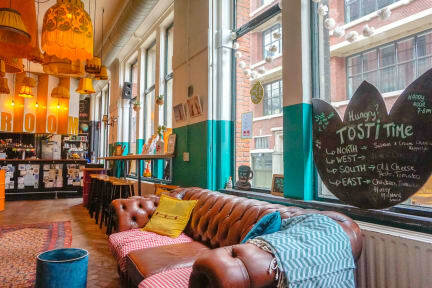 With a free breakfast, funky décor and located in best possible place in Rotterdam, ROOM is ideal for budget travelers who are looking for the real hostel experience!